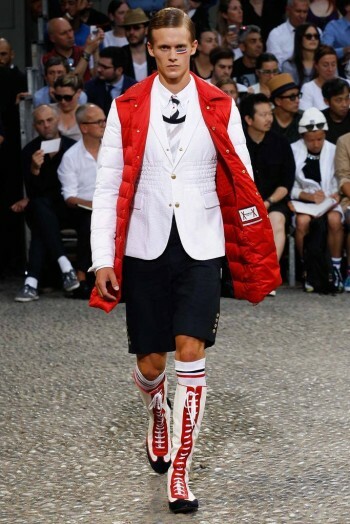 To briefly describe Moncler Gamme Bleu, it is a collaboration between the French-Italian clothing company Moncler and American designer Thom Browne that was debuted in January of 2010. Twice a year, Browne showcases his work at the F/W and S/S Milan fashion weeks. 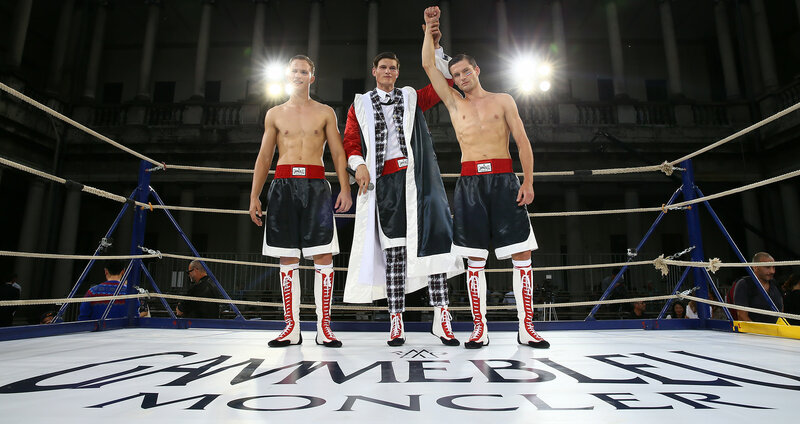 The Gamme Bleu line has always been very athletically inspired and this season is no different. 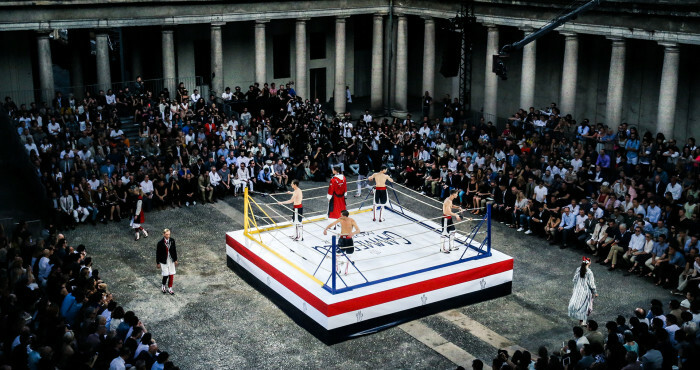 The venue was setup with a boxing ring in the middle, risers on each side and complete with an announcer. 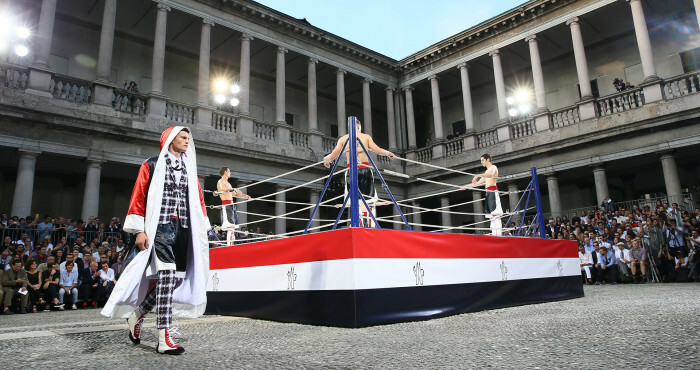 SS15 was showcased by four models wearing boxing trunks in the ring with the remaining models circling outside. 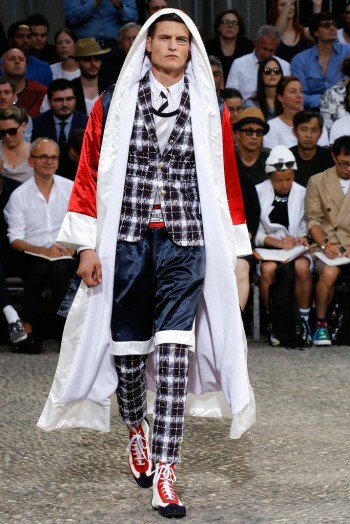 Honestly, this season is the most casual and comfortable Gamme Bleu show I have ever seen. Sticking to the theme, SS15 consisted of laced boxing boots, decorated robes and high-waisted trunks. The Gamme Bleu patch was redesigned to resemble the Everlast logo as well. 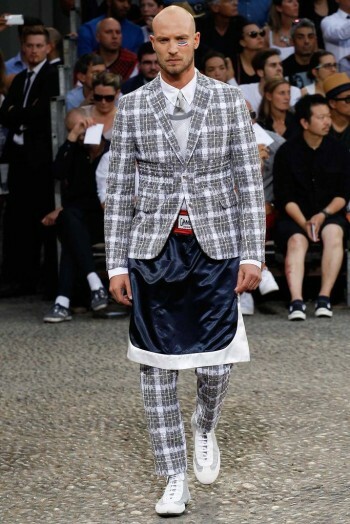 It wouldn’t be a Thom Browne show without cropped blazers and bottoms in seersucker, glen plaid and tartan which are seen aplenty throughout the whole lineup. 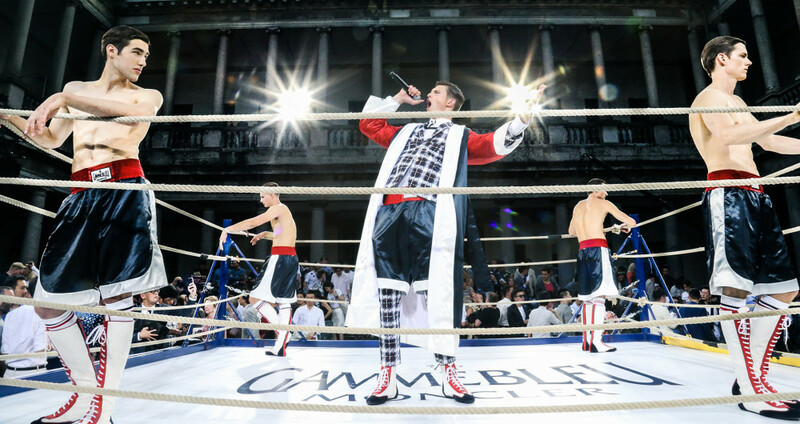 If you take a close look at the jackets, you can see the jackets utilize the lacing from boxing gloves which I find to be an extremely clever way at further showcasing the theme. 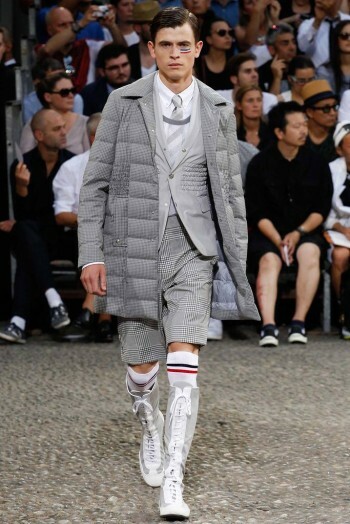 My favorite thing about Moncler Gamme Bleu is how Thom re-imagines the quilted down jacket. 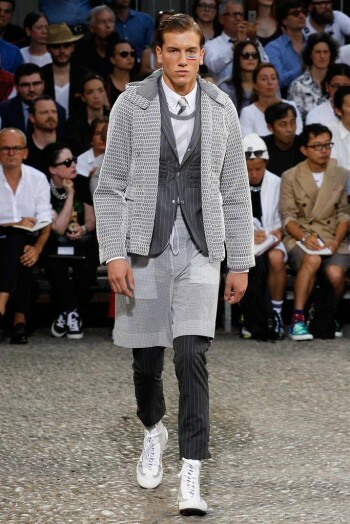 He takes something that is normally very bulky and flattens it out to create a sleek line of coats and jackets. 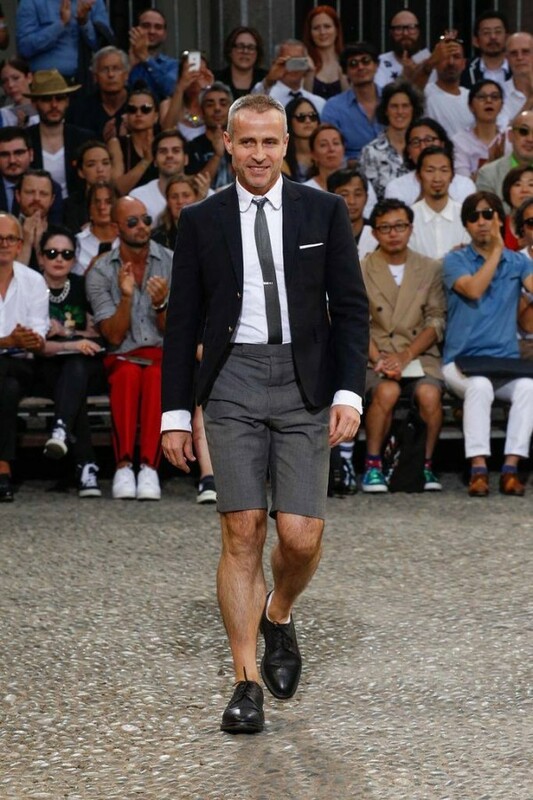 Overall I think this is another win in my book for Browne and I look forward to see what he has to offer for his mainline men’s and women’s S/S 2015 at Paris and New York Fashion weeks. 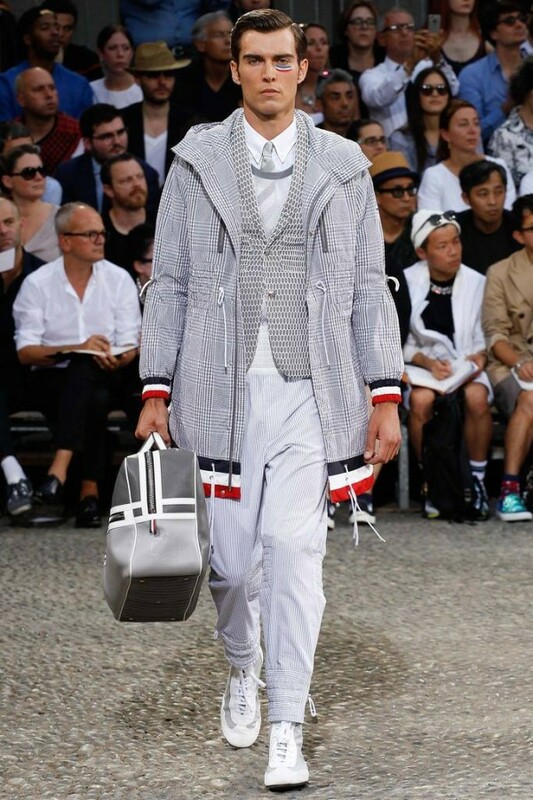 Maybe one day I can sit front row and deliver shots personally taken for my readers until then images are courtesy of Style.com and Moncler. 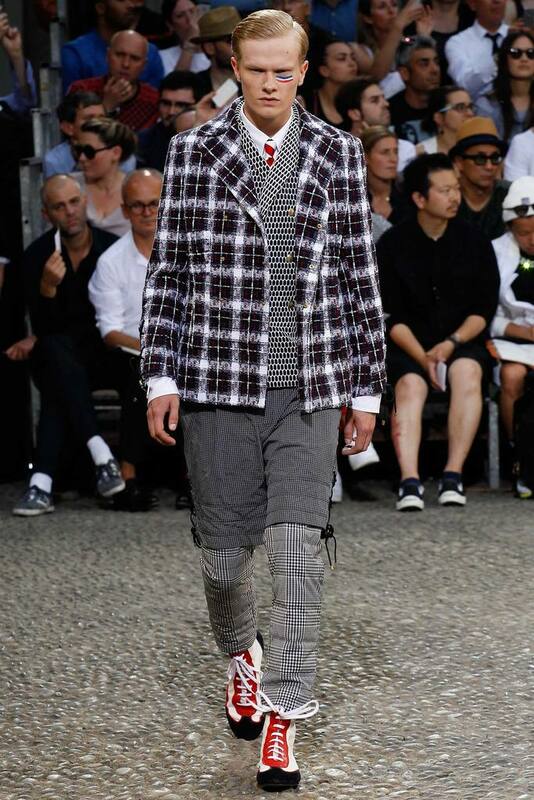 To view additional pictures from the show please visit this link here.